Consumer Medicine Information, or CMI, provides clear, easy-to-understand information to consumers and their carers about how to use their medicines. Importantly, this information is intended for use in Australia only and does not replace advice from a healthcare professional. Please discuss any concerns or questions you may have with your healthcare professional. In Australia, Sandoz makes CMIs available in electronic format to ensure the most up to date consumer medicine information is available at all times. You can obtain a printed copy of a product’s CMI either from your pharmacist when filling your prescription or by accessing this information from the TGA website. Please access the CMI for your Sandoz medicine from the TGA website by searching for the product. Step 2: Type in the full name of the product (i.e. Clopidogrel Sandoz) and click the search button. Additionally, you can download the MedSearch™ app to access the information on your phone. 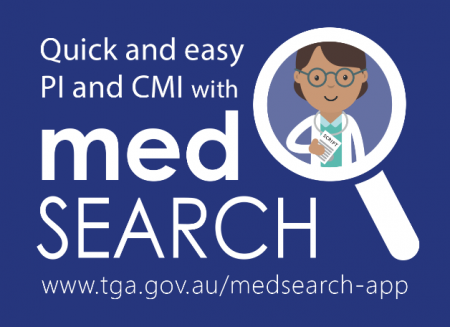 MedSearch™ is designed to help you find, view and save Consumer Medicine Information (CMI) and Product Information (PI) documents for registered prescription medicines approved by the TGA, included on the Australian Register of Therapeutic Goods. Product Information (PI) for Sandoz products in Australia is intended to assist healthcare professionals make decisions about treatment options and provide advice on the appropriate use of medicines to patients. This information only applies to Sandoz products available in Australia and does not apply to Sandoz products in other countries. If you are not a healthcare professional please access the Consumer Medicine Information (CMI) as described above. Please access the PI for your Sandoz medicine from the TGA website by searching for the product.